Rebuild is not a word we hear often in cycling. The system of riders only leaving a team once their contract expires does not lend itself to teams being able to make wholesale changes and revamp their squad, unlike sports such as football. However, this season we will see two teams who have been totally made-over during the winter. The ProContinental outfits Cofidis and MTN-Qhubeka are the teams in question. Here’s a look at what they’ve done and what we can expect from them in 2015. The French squad have spent big (around €1.7m) to bring in star sprinter Nacer Bouhanni from FDJ. The ex-boxer publicly fell-out with FDJ team manager Marc Madiot last season when Arnaud Démare was picked for the Tour de France instead of him. He has dropped down a level for 2015 but now has a team built around him and him alone. A string of capable leadout riders have signed on for the ride, with Dominique Rollin returning to the sport after a fruitless contract search in 2013 saw him sit out last season. Swedish leadout man Jonas Ahlstrand joins from Giant-Shimano while Geoffrey Soupe has followed Bouhanni from FDJ. 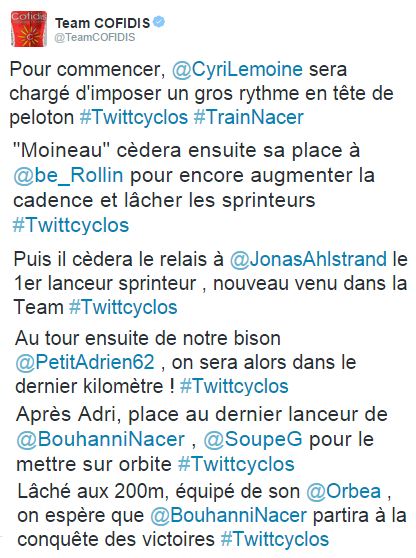 The team showed off this train in a series of tweets two days ago – Lemoine-Rollin-Ahlstrand-Petit-Soupe-Bouhanni will be the order. Cofidis may have put all their eggs in one basket, but it is a very good basket with Bouhanni certainly possessing the ability to challenge for Tour stages, as well as racking up wins elsewhere. Back to the signings and Belgians Michael Van Staeyen and Kenneth Van Bilsen have joined from Topsport – the pair are useful classics men. So too is Steve Chainel who has also joined the team and will be the leader for the cobbled season. The 31 year-old will also be a valuable tutor for promising youngster Florian Senechal. The list of outgoing names include well-known riders such as Rein Taaramäe, Christophe Le Mével and Jérôme Coppel. Le Mével has retired while the underperforming Taaramäe and Coppel have moved on to Astana and IAM repectively. Dani Navarro looks to be the only GC man remaining, and it wouldn’t be a surprise to see him take a Grand Tour stage win or sneak into the Vuelta top ten once again. The African squad have also focused on sprinters in the off-season. The team, run since mid-2014 by Brian Smith, have big ambitions and have brought in a number of high profile riders. First up a look at their three pure sprinters – Theo Bos (Belkin), Matt Goss (Orica-GreenEdge) and Tyler Farrar (Garmin-Sharp). The latter duo haven’t exactly been notable for prolific win rates in recent years – Goss hasn’t stood on the top step of a podium since Tirreno-Adriatico in 2013, while Farrar’s stage at the Tour of Beijing was his first WorldTour level victory since 2011. 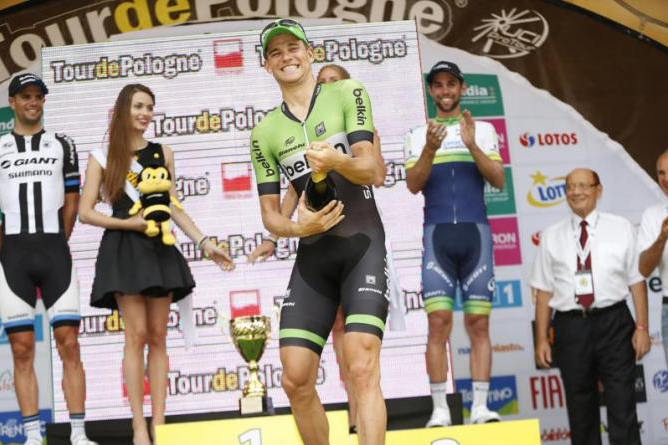 Bos on the other hand, racked up eight wins last season, including a stage of the Tour de Pologne. The biggest name to join the project is Edvald Boasson Hagen, from Sky. A hot prospect in his early years as a pro, he has never really fulfilled the potential he showed with his win at Gent-Wevelgen back in 2009. He will be aiming for the cobbles again, with the team invited to the Ronde van Vlaanderen and Paris-Roubaix thanks to his signing. Steve Cummings, Matt Brammeier and Serge Pauwels are the three other new faces at MTN in 2015. They are all good workers, with Cummings and Brammeier strong in the TT and Pauwels a decent climber. Ex-BMC rider Cummings has already won his first race in his new colours – yesterday’s Trofeo Andratx, part of the Challenge Mallorca. The team’s strategy has been to invest in a group of riders who are big enough in name to get them invites to the big races. The first part of the gamble has worked with the team able to ride wherever they please (Sanremo, Tirreno, Ronde, Roubaix, Dauphiné and the Tour) without having to pay the UCI for a WorldTour license. Whether they can enact part two and deliver victories at that level is another question entirely. 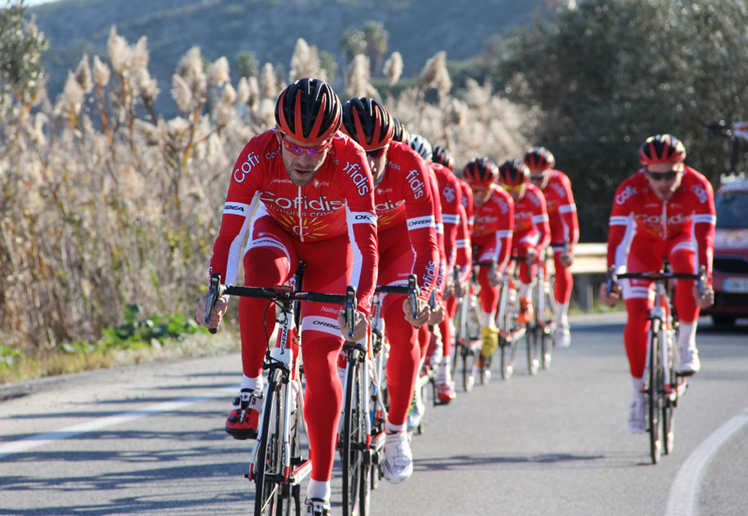 Cofidis and MTN-Qhubeka have invested in fastmen for 2015 but both in very different ways. It is, however, a lot easier to picture the Cofidis train delivering Bouhanni to victory in July as opposed to one of the disparate group of good-but-not-good-enough sprinters MTN have assembled. Put bluntly, Farrar, Bos and Goss simply aren’t fast enough to beat the top sprinters like Cavendish or Kittel. Their recruitment strategy was a big risk and I have my doubt about whether it will pay off. Lack of a plan b seems to be the main risk involved in Bouhanni’s addition, while another question to ponder is how long will it take the team to perfect the art of the leadout? They have five months before the biggest challenge of their season in the form of the Giant-Alpecin train, and management will be expecting Bouhanni & co to be up to speed. A final question that has to be raised about MTN’s additions is regarding the team’s policy of promoting African cyclists. You could almost fill up a Tour squad with the new arrivals, and we have to hope that the team doesn’t ignore talents like Merhawi Kudus, Daniel Teklehaimanot and Natnael Berhane in the pursuit of glory with their big-name signings.